I’ve also written a whitepaper for VMware SMB around the need for SMBs to rethink their virtualization infrastructure and to elaborate on a number of the features and solutions that are now available to SMB customers. Download the whitepaper to learn how these solutions can help your business and your customers. 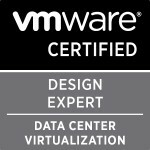 Also keep an eye out on the VMware SMB blog for the fourth part of the series. Categories: Virtualisation, VMware | Tags: BCDR, business continuity, disaster recover plan, SMB, VMware | Permalink. Reblogged this on Business Continuity.